With more than 75 years experience in magazine printing, Modern Litho can easily uphold the title of “expert” when it comes to exceptional quality and efficient production and distribution of your publications. With an annual production of more than 350 magazine titles, we take pride in supporting independent publishers, trade publishers, and associations with turnkey offset and digital print production services taking your content from print, mailing, and distribution to digital publishing and interactive solutions. 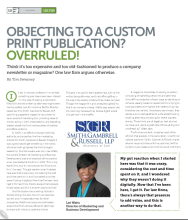 The question of print vs digital for your organizations niche’ publication has been replaced with “can you deliver both?” And in a word, the answer is “yes”! Recognized as one of the Top 20 US publication and magazine printing service providers in 2015 by Publishing Executive, Modern Litho is designed to provide an ideal magazine printing services for short-to-medium run length publications by utilizing the advanced technology of our Heidelberg presses featuring 10-color perfecting capabilities, double-aqueous coating, and in-line sheeting. Combine these impressive offset print capabilities and G7 Master Qualification (for digital proof-to-print color reproduction) with our in-house mailing and distribution, and you’ll experience streamlined production and service that has earned us industry awards and customer accolades for decades. 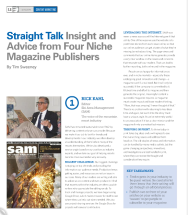 Looking for digital publishing options to compliment your printed magazine? Look no further! Modern Litho can develop a custom application (app) to add a new dimension to your readers experience with your print publication, taking them online for an interactive digital mobile edition of your magazine. Whether it’s a mobile device, tablet, or desktop, retain the attention and engagement of your readers with the added benefit of electronic distribution, while providing direct links and seamless mobile marketing opportunities for your advertisers and partners. Interested in learning more about our custom magazine and publication print and interactive digital solutions? Check out or Client Resources or request more information here.